A digital tool designed to give teaching professionals an easy way of providing personalized fitness for their golfers. Golf fitness is becoming an ever-increasing factor for serious golfers wanting to improve their game as more and more teaching professionals, and coaches alike are realizing the body is an essential tool for becoming a better golfer. Expand the possibilities as a coach, ensure that you are optimizing all aspects of training for your students. Stay engaged with their students in-between lessons. Screen golfers in 10 minutes. Kinexit will do the rest for you. Kinexit complements the programs and packages you already offer your golfers. All you need to do is help your golfers take the screening. 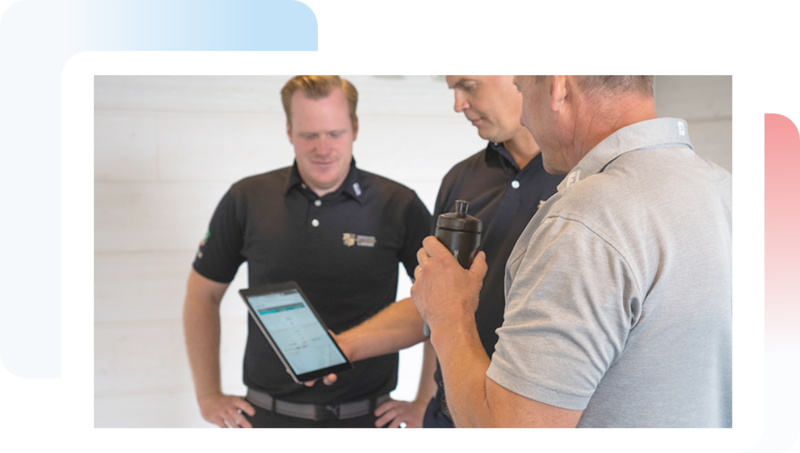 Kinexit will then identify your golfers pain, stiffness, and restrictions and automatically create fitness training programs which focuses on improving these areas. Get your golfers playing more. To experience measurable results within a short time frame, we recommend golfers workout with Kinexit at least 15 minutes 3 times per week. We recently studied a group of Kinexit users which showed more rounds played, higher swing speed, more distance, and lower scores. 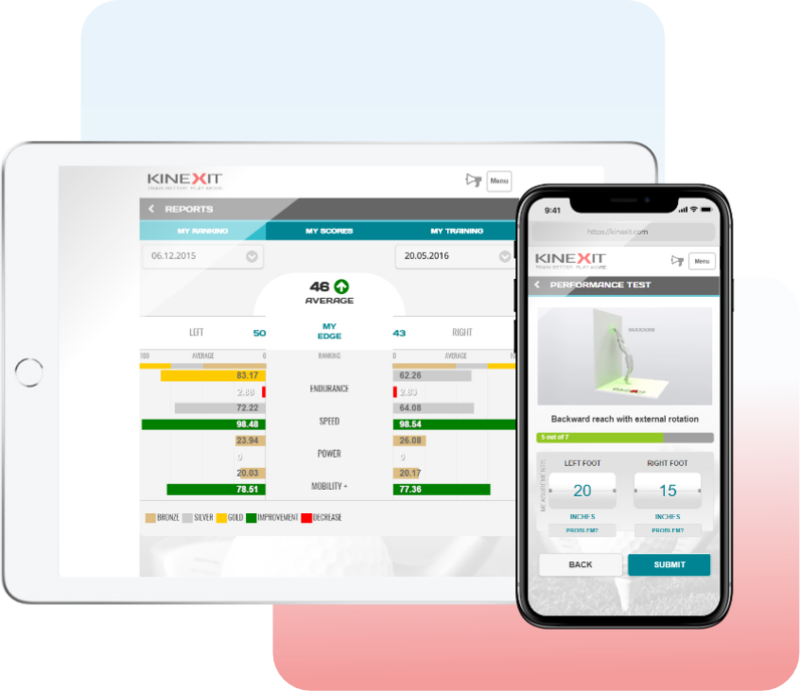 Kinexit removes the effort from testing, developing training programs and keeping track of your golfers. Create, send and track your golfers online on one platform. With Kinexit, you can increase your revenue and earn more. Our teaching professionals, academies and clubs have one thing in common: they all have a unique set-up. We use custom pricing to find the best solution for your business model. Whether you’re buying for a single lesson, adding value to your lesson packages or looking for a club solution. That’s why we need more information about your needs. Our plan starts with a 14-day trial. No strings attached. What do our clients say about Kinexit? "Many of my students experience stiffness or pain when playing golf. After using Kinexit's training and warm-up exercises, my students feel a huge difference in their body. They’re booking more lessons and spend more time on the course." "My golfers have improved their fitness, enjoy their golf more and play more rounds using Kinexit. We have a tool that’s easy to use and shows how all areas of the body impact the golf swing for my clients." "I’ve been looking for a digital fitness solution like Kinexit for a while now. I’m excited to get started with my juniors and athletes as this will help take my students to the next level with their golf game." "When I have lessons with my students, I want to focus on their swing and technical abilities to help them improve. It’s not uncommon for me to have students with high potential but due to for example lower back pain, golfer’s elbow or other restrictions, they are unable to get into the right positions during the swing. With Kinexit, my students can work on their fitness in-between lessons and when we are together, we can focus on improving their swing without having to compensate for restrictions. This will help my golfers play more and enjoy their golf even more." "Kinexit is perfect for our requirements. We needed a tool for golf related physical exercises which we easily can hand over to our members and they can work on it in their own time. The real cool feature here is that we can follow their progress through our coach dashboard as well as send them follow up videos and messages. We’re looking forward to introducing this to members. Adding Kinexit to FlightScope and other training aids in our studio is a real enabler for development this winter." "The featured educational seminar was our Winter Teaching Summit, showcasing some of the brightest minds in teaching and player development. Thank you for delivering a captivating presentation to our PGA Professionals on how they can provide fitness training to their students. We carefully select our partners to ensure our PGA Professionals are exposed to companies offering services which can help grow both their business as well as the game of golf. Improving players' mobility, stability, and strength will undoubtedly improve their ability to properly swing the golf club. Your passion and knowledge of fitness, and how it impacts the golf swing was impressive." "We know fitness is an important component when developing players. We also know that putting together personal programs is the most efficient way for players to develop. The challenge of creating personal fitness programs is it's very time-consuming. I’ve been looking for a solution where we can create individual programs for each player, track their progress and adjust based on how they develop." Kinexit recently participated in a sports-tech start-up boot camp. Below is an article from KTH Innovation. Original piece can be found here Ten startups who all support and empower the athlete, enter SPIN Accelerator Sweden, Sweden’s first sportstech accelerator program.